To start off we first got a close look at Marra Forni ovens in March of 2015 at the International Pizza Expo. Yes, Brianna and I are total pizza nerds and visit that show every year to see all the new equipment in the industry. We also go to that show yearly because Vegas is pretty fun to visit! At that show we connected with the team at Marra Forni and they asked us cook at their booth for the 2015 National Restaurant Association Show in Chicago. 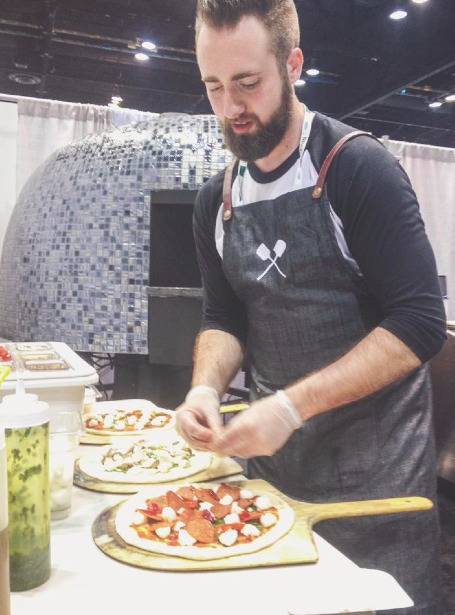 Jonathan Cowan making pizzas at the Marra Forni booth at the 2015 National Restaurant Association show in Chicago, IL. We ended up cooking 500+ pizzas over four days. Brianna and I concluded that Marra Forni makes the best ovens we have ever tested. After everything was said and done in 2015 Wooden Paddle catered weddings, graduation parties, birthday parties, firework displays, corporate functions, concerts, brewery events, summer festivals and even a pumpkin festival in all totaling over 100 events. Because of our busy schedule we did have to turn down a lot of events last year. We decided at the end of the year that we would buy a new Marra Forni mobile oven to help with the demand. In doing our due diligence and the promise of eating the amazing culinary work of Jeff and Anthony from Marra Forni, we took a trip to Beltsville, MD in January to check out the test kitchen and manufacturing warehouse for the ovens. Business development for Marra Forni Anthony Pilla with Wooden Paddle Co-Founders Jonathan Cowan and Brianna Cowan. Our new oven will be coming in just in time for the 2016 catering season. When it comes in we will definitely be posting pictures of it! Thank you everyone for your support last year. We have already started hiring and training so we can give the best mobile wood-fired pizza/catering experience in Chicagoland with our two ovens in 2016 and beyond!